In addition to surveys and forms, SmartSurvey can be used to create quizzes. Quizzes differ from surveys in a couple of important ways. The first is the fact there are right and wrong answers involved, and the second is usually the inclusion of direct feedback to the user as to how they did. Quizzes have long been quite effective as social media content – combining fun themes, and the sense of challenge and play makes them sharable content as participants share their scores and challenge their friends. This guide is intended to explain the use of various SmartSurvey features that are useful in the context of a quiz. Applying scoring to a survey is quite simple, and explained in the Scoring guide. To show the player their score at the end of the Quiz, follow the instructions on this linked guide. A popular format for quizzes is where each question is presented on its own page, and then the participant is shown details of their success (or otherwise) on the next page. The question itself has Skip Logic on it set up so that when the player responds with the right answer, it “Jumps to” the Right Answer page. This then follows directly to the next question. The Wrong Answer Page has Page Logic set up so that when the player clicks “Next Page”, it will take them straight to the next Question page, bypassing the Right Answer page. This pattern repeats through the whole quiz. These sorts of questions pose a challenge because of the way Skip Logic works, as it’s not possible to create a Skip Logic rule that checks for “if the response is all of A,B,C,D”. because of this, we have to flip all the logic over and do it in reverse. Instead of checking the player has chosen all the right answers, we check if they’ve chosen any wrong answers. 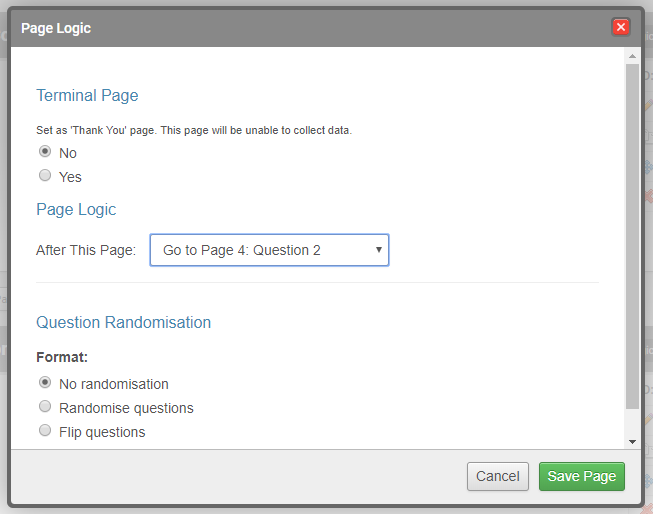 To start, we set up page logic on the Question page so that the page’s default behaviour is to go to its Right Answer page. Next, we set up the question so that the player has to enter exactly the number of answers we’re looking for – this is done in the validation settings of the question. With this done, we set up the Skip Logic to detect any of the wrong answers, so if we have options A, B, C and D, which are right, and D, E, and F, which are wrong, we create Skip logic that says “Choice is any of D, E, F” with the action of “jump to” the Wrong Answer page. Triggered Skip Logic rules on a page override any page logic rules it has, so this is how the survey routes people correctly. Because the player has to choose the number of choices we’ve determined, if they don’t choose all the right ones, they must have chosen a wrong one, which is why the logic works. Using piping to refer to the player’s answer when showing a follow-up page is a great way of making the quiz seem more personal, like a back-and-forth conversation. Doing this is one of the simplest ways to use piping and so trying something like this is a great way to learn how to use the feature. If you’re making a quiz, you might feel that much of the default text isn’t necessarily appropriate. By Default text, we mean the text that doesn’t form part of the survey’s questions and answers -so the buttons, error messages, and so on. To change the text that’s shown on buttons, you can do this in the survey settings, in the “Appearance” section. To change error messages and other system text, you can do this by editing the survey’s translation. It’s a good idea to hide the button that allows people to return to earlier pages in the survey to prevent cheating (otherwise, participants could go back and change to the correct answer). This setting is also found in the Appearance section of the survey settings. Usually, you’ll want to show the respondent their score at the end of the quiz. You can find out how to do that using this guide, which explains the correct piping to use. Email triggers can be used to send participants an email at the end of the quiz with their score. You can even use the techniques described in Conditional Email Triggers to send these emails only when a participant gets all the questions correct.